To submit a donation request please click here. 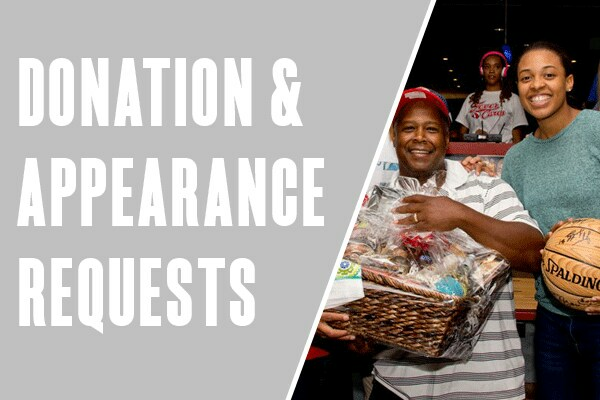 If you would like to submit a donation request to the Indiana Pacers please click here. Please note that separate forms must be submitted for each team. Included with your donation there will be a donation form for you to fill out. Please return the form filled out to the address provided after your event. Thank you for your interest in and support of the Indiana Fever! All requests must be submitted through the online form below with the appropriate fields completed. The Indiana Fever do not accept form letters, faxes, e-mails or requests through the mail. The Fever cannot provide regret notices for appearances we cannot attend and event coordinators should only consider their request to be scheduled upon receiving confirmation from the Fever organization. The Indiana Fever may not be able to confirm participation until one week prior to the event but every effort will be made to provide confirmation of player’s availability as soon as possible. Appearances will not be scheduled on game days, travel days, player off days, or during practice. Requests are primarily limited to the Indiana area. Fever players are generally available May through August. Please note that most players play overseas during the WNBA offseason and therefore not available in the offseason. Fever coaches and staff are generally available year round, however, have a busy scouting schedule January through March. Although players and coaches are eager to reach every fan, their availability it limited. The Indiana Fever will make every effort to accommodate as many requests as possible. If you are interested in having a member of our organization participate in your event, you must complete the form below. You must submit the appearance form 6-8 weeks prior to the scheduled event. Once your request has been reviewed, you will be contacted by our Fever Player Relations Department if the request can be fulfilled.